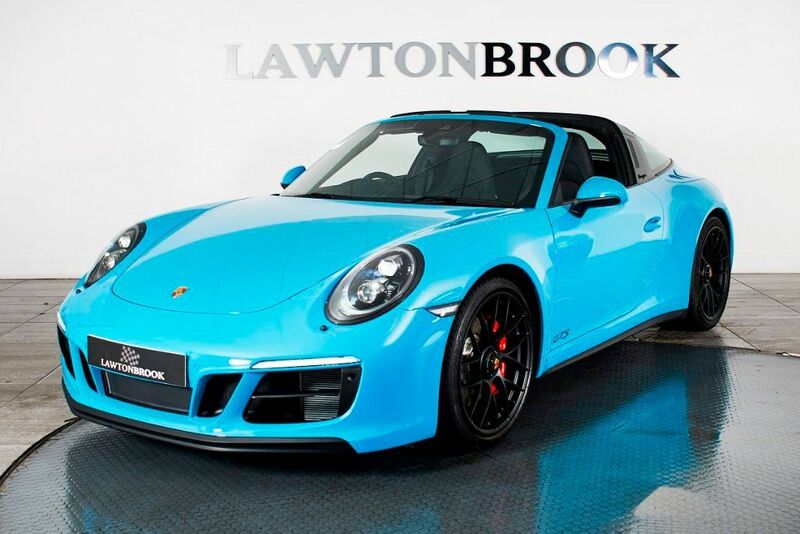 Today’s Porsche of the Day is this stunning 911 Targa 4 GTS finished in Miami Blue from our sister company, Lawton Brook. Presented in stunning Miami Blue, with complimenting black alcantara interior, this vehicle really is a sight to behold. With the stunning 20″ 911 Turbo S matte black centre locking wheels with red brake calipers, matte black roll over hoop, matte black lettering, trims and exhaust finishers the car is simply stunning. The factory optional specification is vast and compliments the already generous standard trim. Sport Chrono package is standard, as is the sports exhaust. Our car has the highly desirable GTS interior alcantara package, complete with passenger side ISOFIX compatibility, heated front seats and multi functional heated steering wheel, park assist front and rear including reversing camera, cruise control and the superb BOSE Surround Sound System. Thoughtfully specced and as new throughout, this delivery mileage example of the much sought after 991.2 Targa 4 GTS is a fantastic ownership proposition and represents value for money at £134,990 and is also VAT qualifying. Visit the Lawton Brook website for the full vehicle details. For a Finance Quote on a Porsche, click here.